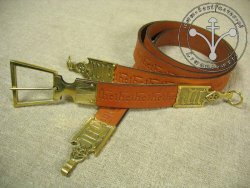 Sword belts are based on iconography and extant examples of fittings from belts and scabbards. 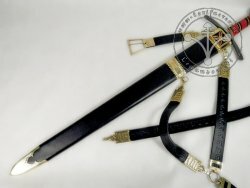 All available belts (without scabbards) have ready-to-assemble mounting rings, which (though they are very durable) should be soldered closed after fixing them to the scabbard fittings. 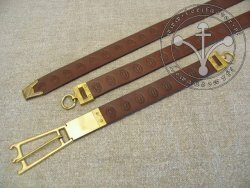 We can do it for you, in which case you will be asked to send us your scabbard with fittings. 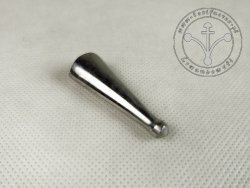 We fix scabbard fittings only to scabbards made in our workshop. 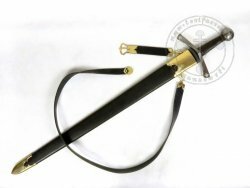 Sword scabbards are made of leather. 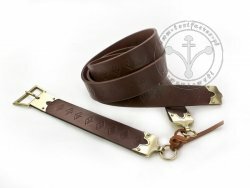 The inside is made of several layers of leather sewn together, hardened and shaped to resemble a wooden scabbard. 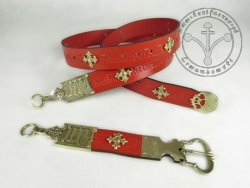 The outermost layer is thin leather sewn on the back side of the scabbard. 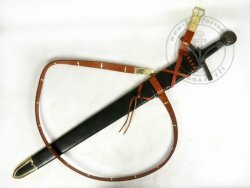 A leather scabbard is more durable than a wooden one – it’s elastic and doesn’t break when hit or when you fall down on it in a fight. 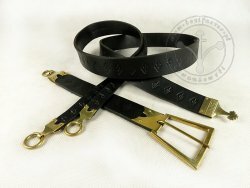 402 SH Sword girdle "from Londynu" for 14-15 cent. 403 SH Sword girdle - stamped for 14-15 cent. 404 SH Medieval Sword girdle for 14-15 cent. 405 SH Medieval sword girdle for 14-15 cent. 501SH.1 "IHC" Sword girdle for 14-15 cent. 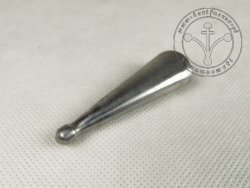 501SH.M "IHC" Sword girdle for 14-15 cent. 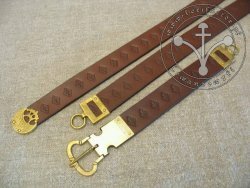 502 SH "IHC" Sword girdle for 14-15 cent. 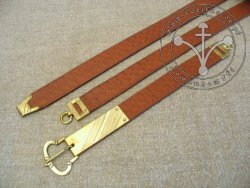 504 SH Sword girdle for 14-15 cent. 507SH Sword girdle "John de Creke"
509SH "IHC" Sword girdle for 14 cent. 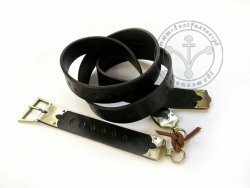 510SH Sword girdle for 14 cent. 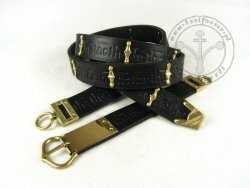 511SH Sword girdle for 14 cent. 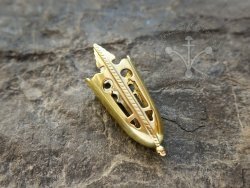 A-044A Scabbard chape for 14th cent. 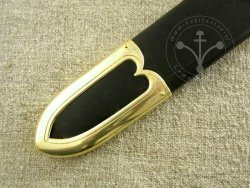 A-045 Scabbard chape for 13th cent. A-046 Scabbard chape for 14th-15th cent. 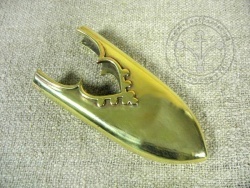 A-047 Scabbard chape for 14th-15th cent. A-048 Scabbard chape for 14th-15th cent. 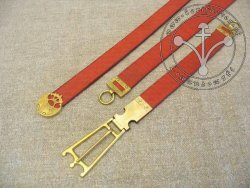 SC-03 Sword belt & Scabbard for 13-th cent. 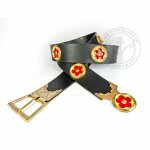 SC-04 Sword belt & Scabbard for 14-15th cent. 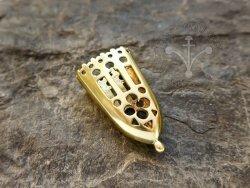 Scabbard has a decorated scabbard end fittings, characterisictic for the end of 14th century, patterned on St Paul William de Breyne's sword. 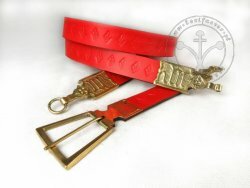 Lower fitting of scabbard is patterned on St Andrew Lutrella's sword (1395) from London cathedral. 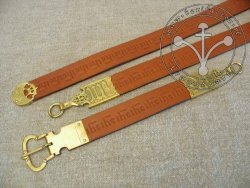 SC-05 Sword belt & Scabbard for 14-15th cent. 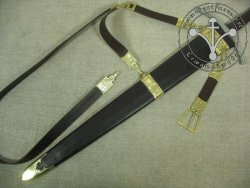 SC-06 Sword belt & Scabbard for 14-15th cent. © Lorifactor.com. Wszelkie Prawa Zastrzeżone. All Rights Reserved.